Here you will find information about upcoming and recent publicity/events concerning the BraBall. Also see the Press page. Dear BraBall supporters, I have EXCITING NEWS! I've found a permanent home for the BraBall sculpture. You can now see the BraBall sculpture at The American Visionary Art Museum in Baltimore, Maryland. This remarkable museum is the perfect home for the wonderfully weird BraBall. Go here for visitor information: AVAM. The Final BraBall Roll-On was a great success! It was held on August 24, 2003, at SOMARTS Gallery in San Francisco, and benefitted the Women's Building. Volunteers who came throughout the day helped add more than 7,000 bras to The BraBall. This was the final public workday for the sculpture. 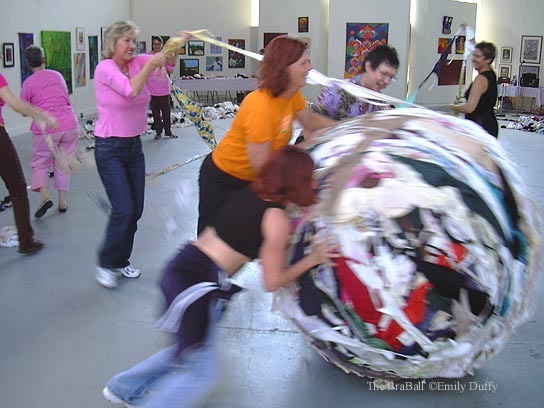 Rolling The BraBall at SOMARTS Gallery, San Francisco. August 24, 2003.